An Extensive Line of Potentiometers, Trimmers, Dials and Knobs from NTE Electronics, Inc.
NTE has partnered with two of the premier suppliers in the industry, Precision Electronics, LTD. (P.E.C.) 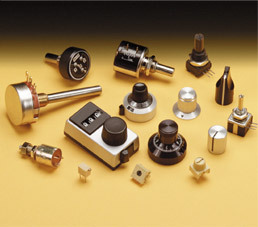 of Canada and KILO International, to bring you a full line of potentiometers, trimmers, dials and knobs. With over 500 line items, we're sure you will find the right device for your application. Single-turn 16mm and 24mm potentiometersNew!